Tired of green salad? This flavor filled quinoa salad with mango and avocado topped with an orange cumin vinaigrette is my new favorite! I promise you won’t be bored. 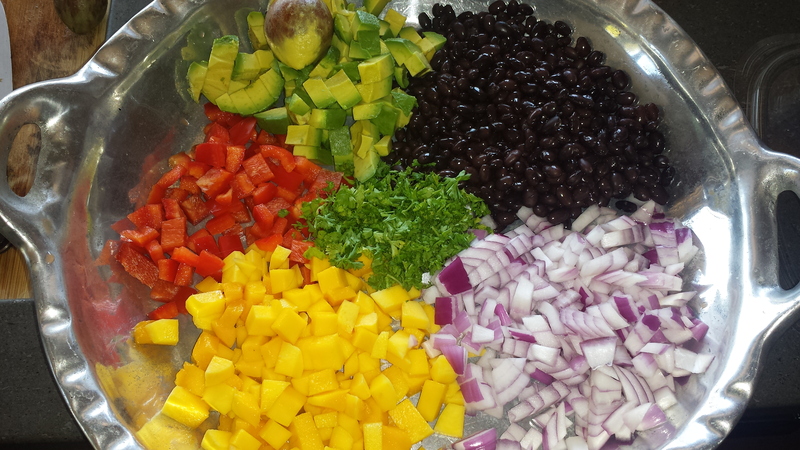 It’s a little bit spicy from the jalapenos, a little bit sweet from the mango, the black beans add a rich salty flavor and fresh avocado, purple onion, bell pepper and cilantro make it salad worthy. Yum! This is the perfect dish to throw together for an easy dinner or bring to a potluck, especially if you have leftover quinoa on hand (or you make it ahead), then it’s only about ten minutes of chopping, mixing and you’re done! This salad can be made a day ahead, without the avocado. Bring to room temperature then gently toss in the avocado, if using, before serving. VARIATIONS: If you don’t have, or like, mango, you can substitute orange or nectarine segments (or even canned or frozen corn). Use a combination of yellow, orange, red and green bell peppers for lots of color. This recipe is only mildly spicy using one red jalapeno pepper so double the amount of jalapeno peppers and add a bit more cumin if you like it hot. Rinse quinoa to remove bitterness and cook according to package instructions; set aside and let cool. To make the vinaigrette, whisk together olive oil, apple cider vinegar, orange juice, cumin and salt in a small bowl; set aside. 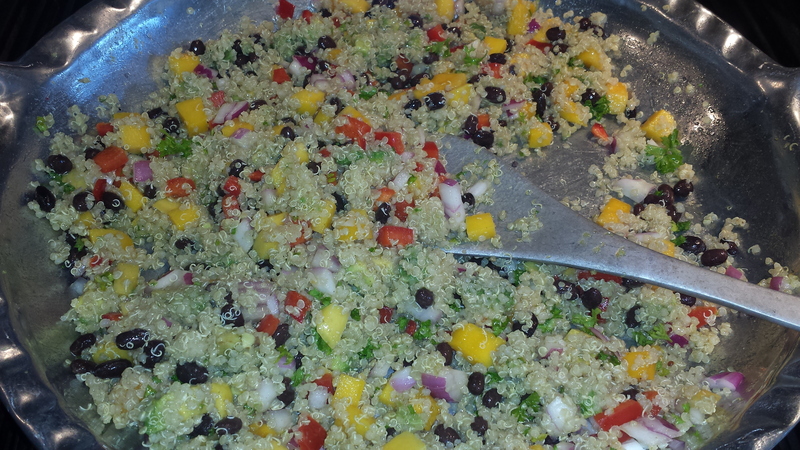 In a large bowl, combine quinoa, mango, bell pepper, jalapeno, black beans, avocado, onion and cilantro. Pour the vinaigrette on top of the salad and gently toss to combine. If you aren’t serving immediately, place the avocado pit on top of the salad to keep the avocado from turning brown, or add the avocado right before serving . Serve at room temperature. This entry was posted in All Recipes, Salads, Vegan, vegetarian, Wheatless Wednesday and tagged avocado, Black Bean and Mango Salad, Black Bean Quinoa Salad, black beans, gluten free, green bell peppers, mango, Orange Cumin Vinaigrette, Quinoa, quinoa salad, Vegan, vegetarian, Wheat Free, Wheatless Wednesday. Bookmark the permalink. I’m on a mango kick lately! I’m not the biggest fan of beans, but the flavors in this dish sound delicious. Thanks for sharing! I am also on a mango kick. I love black beans but you could leave them out or substitute peas. Let me know how it goes. Yum! I am always down for some mango and avocado! 🙂 And thanks for checking out my blog! Love the colours! i have some guests tomorrow and I am going to impress them with this salad! Thank you! Wonderful! I hope they love it. Happy Humpday! I am working on a Tomato and Zucchini Tart that is not quite ready for publication yet. The cornmeal parmesan crust is a bit heavy and needs some reworking. So stay tuned for a new summer staple! 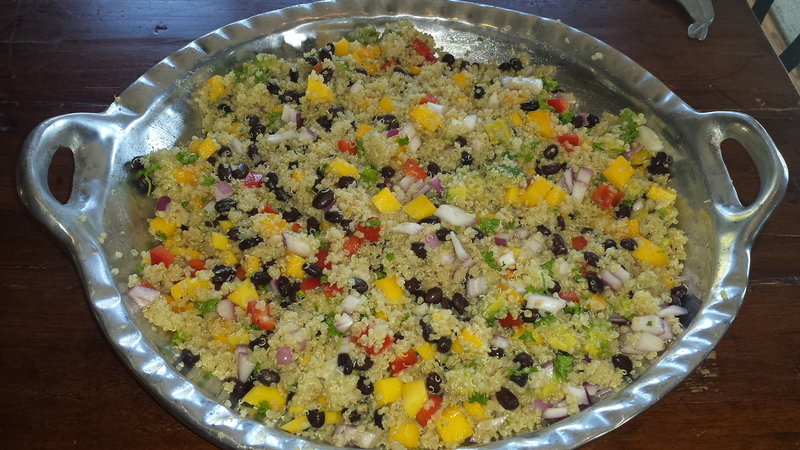 I also went back through my old favorites looking for a yummy dish for tonight and ran across this flavorful Quinoa Salad with Mango and Black Beans tossed with a delicious Cumin, Orange Vinaigrette that I originally posted two years ago. Wow, time flies! I loved this flavor combination and will be making today. Sharing is caring… Enjoy!